The 57th Student Government Association is a 15-member council under the umbrella of the Enrollment Management and Student Success Division. We represent the interests of our fellow students while protecting and preserving the traditions of the University. We aim to recruit more new students through outreach endeavors and activities. We support our student organizations academically and through community events. Our motto is: STUDENTS FIRST! Acting Gov. Joshua Tenorio and Acting Lt. Gov. 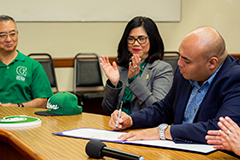 Tina Muña Barnes signed a proclamation declaring March 12 as University of Guam Charter Day and March 10-16 as University of Guam Charter Week. 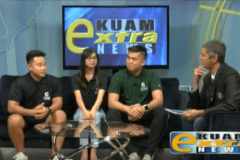 UOG President Robert Underwood conducted the swearing in of the newly elected officers and senators of the 57th Student Government Association on Aug. 3.